Jaffa cakes are no where near as tricky to make at home as you might think. The only fiddly bit is making the chocolate look perfect – but they're still great if you just spoon it over. 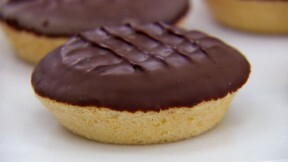 This jaffa cakes recipe by Mary Berry is featured in Season 4, Episode 1. For the jelly, break the jelly into pieces and place in a small bowl. Pour over the boiling water and stir until the jelly is completely dissolved. Add the orange zest, then pour into a shallow 12x8in tray. Chill in the fridge for 1 hour, or until set. Meanwhile, preheat the oven to 350F and grease a 12-hole, shallow bun tin with butter. For the sponge, whisk the egg and sugar together for 4-5 minutes until pale and fluffy, then gently fold in the flour. Fill each well in the bun tin three-quarters full (about a dessert spoonful per hole) and smooth the tops. Bake for 7-9 minutes, or until well risen and the top of the sponges spring back when lightly pressed. Leave to cool in the tray for a few minutes then finish cooling on a wire rack. To assemble, break the chocolate into pieces then melt in a bowl set over a pan of gently simmering water. Remove the bowl from the heat and leave to cool and thicken slightly. Turn the jelly out onto a sheet of non-stick baking parchment. Cut 12 discs from the orange jelly using a 2in round cutter. Sit one jelly disc on top of each sponge. Spoon the melted chocolate over the jelly discs. Using the tips of the tines of a fork or a skewer, lightly press to create a criss-cross pattern on top of the chocolate, then leave to set completely. You may need to reheat the chocolate a little if it starts to set before you have finished all the jaffa cakes. For this recipe you will need a 2in round biscuit cutter, a 12x8in baking tray and a 12-hole shallow bun tin. Note: This recipe contains U.K. measurements and may require conversions to U.S. measurements. It has also not been professionally tested.